It may seem shocking, but the electric eel at Georgia Aquarium receives preventative health check-ups just like we do! However, the process isn’t that simple. In order to make sure the eel is comfortable, it’s important to administer anesthesia to keep it calm. The anesthesia also helps protect our team of veterinarians and aquarists while they work, since the electric charges released by the eel decrease when while under anesthesia. This is important as electric eels can produce a shock exceeding 500 volts! The question remains – how do you administer anesthesia to an electric eel? For veterinary procedures involving fish, our veterinarians combine a powdered version of the anesthesia drugs with water. The fish ingest the drug through their gills and will begin to fall asleep, allowing veterinarians to take gill and scale samples. Once the fish is placed back into regular water, the anesthesia quickly wears off. Even though an electric eel is a freshwater fish and has gills, they breathe air through their mouths! This is due to living in murky waters that contain little oxygen. Since electric eels breathe through their mouths, the aquarists needed to place the electric eel in an environment that would keep him submerged in the water. You can see this in the photos that are attached. The chamber holding the eel is full of water and has no airspace above the water This was necessary to help the eel begin using its gills in the water in order for the anesthesia to enter its bloodstream. Our team of veterinarians and aquarists began preparing for the procedure in our state-of-the-art Correll Center for Aquatic Animal Health. Before placing it in the exhibit, the team first weighed the eel to make sure they were using the correct amount of the anesthesia. While the aquarists waited for the anesthesia to take effect, they used a voltage meter in the water to read the number of volts the eel was releasing. The number of volts decreases when under anesthesia, and when it reached a safe level, the aquarists, donning protective rubber gloves, moved the eel into a specialized surgical habitat. This habitat was created at Georgia Aquarium in order to provide safe, preventative health check-ups specifically to electric eels. The surgical habitat holds water with a lower dose of the anesthesia, and a small plastic tube that is placed in the gill slit to help keep it asleep. Once the eel was comfortable and in place, our team of veterinarians went to work. They began taking ultrasounds to better look at its organs to make sure everything looked healthy. After the ultrasounds, blood samples were taken to check for potential pathogens or parasites. To get a better look at the inside of the eel, x-rays were taken. The vital organs of this species of eel are compressed into the very front of its body near its head, and the rest of the body is made up of its electricity-producing tail! After the procedure was complete, the eel was placed back into freshwater where the effects of the anesthesia began to wear off, and was soon returned to his habitat in our Southern Company River Scout gallery. 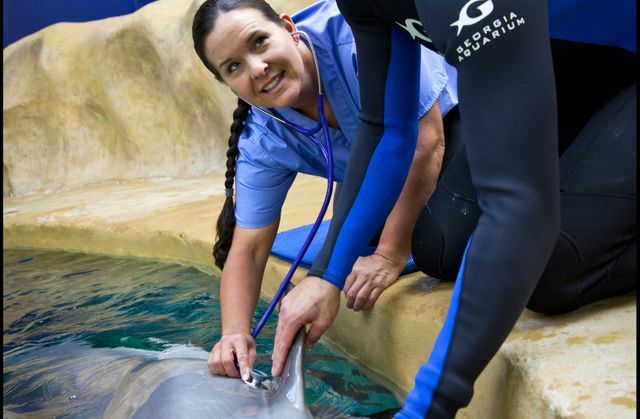 Preventative health check-ups are important to maintain the highest level of health and care for all of the animals at Georgia Aquarium. These check-ups are done on a regular basis by expert aquarists and veterinarians. 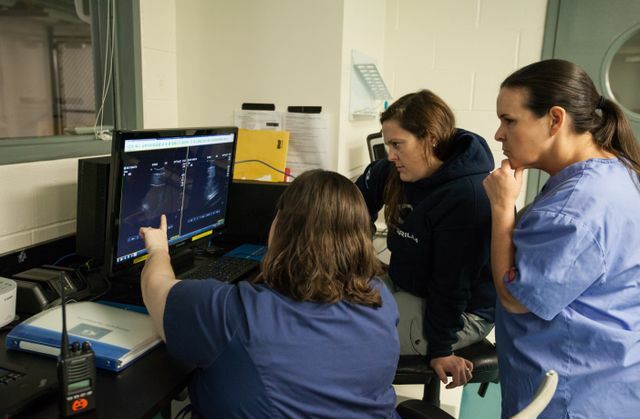 Don’t miss out on the opportunity to view our animal health facility that can be seen on our Behind the Seas tour. 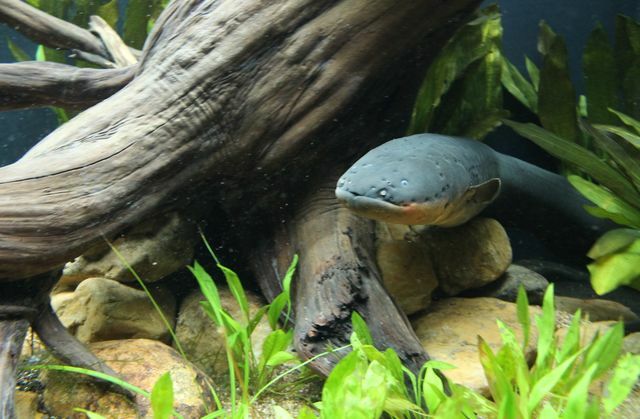 To learn more about electric eels, visit our animal guide.